Here is some updated information on the first galactic classical nova of the year, Nova Muscae 2018. The AAVSO database shows the steep dust dip to the mag 16s in March and the most recent obs were fainter-thans ending with <15.7 vis in mid-July. This indicates essentially that the nova didn't recover from the dip. 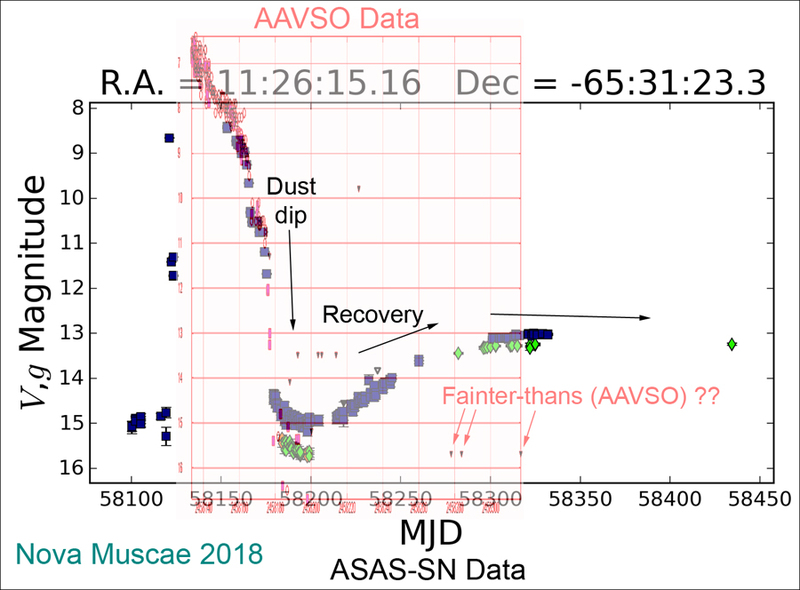 But a check of the ASAS-SN data shows a recovery after the dust dip to around mag 13 (g & V) in July-Aug with the most recent obs of 13.2 g only a week ago. The last 3 obs in the AAVSO database are obviously incorrect - overlay of AAVSO & ASAS-SN light curves attached. This nova is still worth observing. Thanks for pointing that out, Robert. Obviously misidentification on my part. I have deleted those 3 observations. I'll try again when the weather improves.